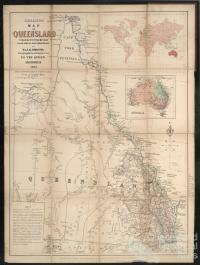 One of the first provisions made by the new Queensland Parliament in May 1860 was to encourage immigration to the vast land area encompassed by the newly declared colony. By the end of the year, the first Agent for Immigration, Henry Jordan, had arrived in England to recruit new settlers. Jordan and his successors including Richard Daintree, Thomas Archer and James Garrick, lured English, Welsh, Scots and Irish to migrate half way across the world to Queensland. Initially these endeavours were supported by the home governments but before long anti-emigration leagues campaigned against their leaving, realising that those most likely to travel were young strong workers and their families vital to the growth of any country. Over a quarter of a million people ignored these admonitions and travelled to the northeastern Australian colony in the 40 years preceding federation in 1901. 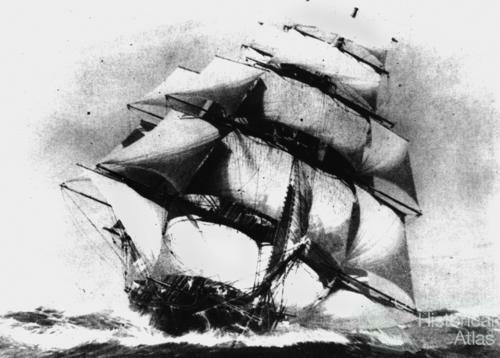 Following on the successful programme developed by the colony of New South Wales which had instigated immigration to Moreton Bay in 1848 with the arrival of the Artemisia, sailing ships carried the majority of travelers. The Suez Canal had opened in 1869 and finally in 1881, with the signing of a mail contract, the McIlwraith government in conjunction with the British Steam Navigation Company inaugurated a regular steamer service. 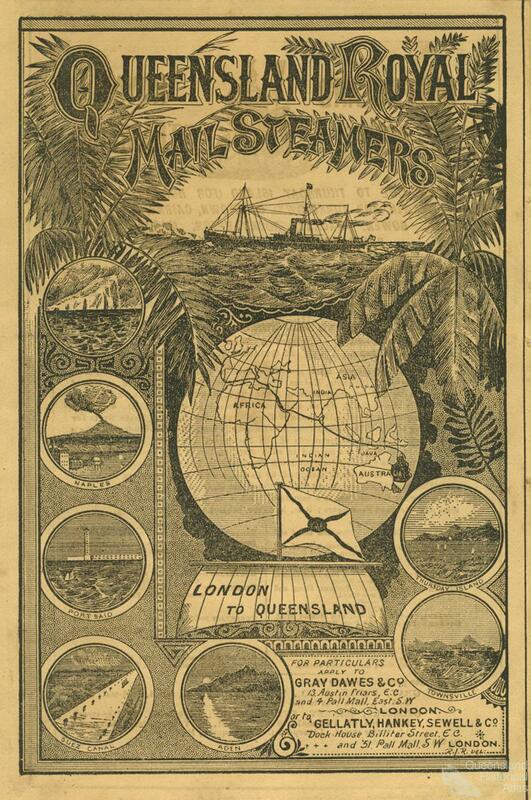 Instead of the first port of call being Moreton Bay/Brisbane as the sailing vessels travelled the Great Circle Route via the south of the continent and then moved north along the east coast, the new steam ships could use the Mediterranean and then the Canal to approach Queensland from the north. 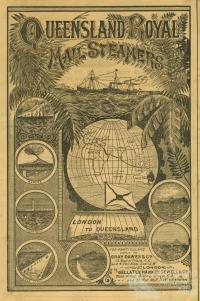 This meant that several ports along the eastern coast established reception depots for immigrants with the result that Queensland was the only colony to populate its territory from towns stretching along the entire eastern seaboard. Ports of arrival from the north included Thursday Island, Cooktown, Cairns, Townsville, Bowen, Mackay, Rockhampton, Bundaberg, Maryborough and Brisbane. All other colonies were restricted to ports near their capitals. In 1901, by far the largest contingent - 50% - originated in English counties with the Irish contributing 25% and the Scots and Germans about 13% each. Welsh travelers were subsumed within the English numbers. Also during these years Chinese, Japanese and Melanesians were absorbed into the population although many of these later returned to their homelands. 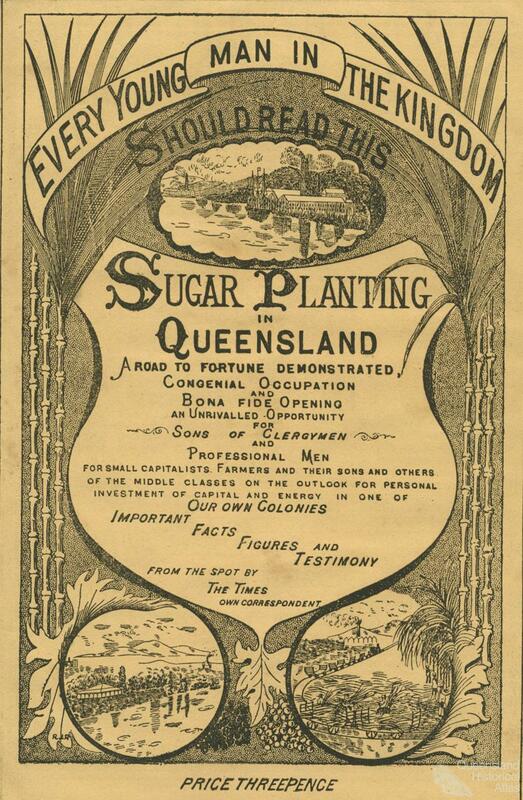 Despite this vigorous immigration input, the greatest proportion of Queenslanders were native-born although many of their parents initially had moved to one of the southern colonies or New Zealand before venturing to Queensland. 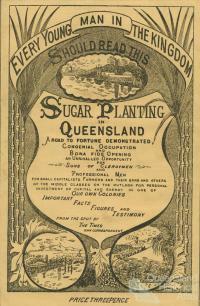 Growing from a population of 30,059 in 1861, over half a million were resident in Queensland in 1901, due to an influx of over a quarter of a million overseas incomers, a surge of settlers from the southern colonies and New Zealand, as well as a healthy increase in the local birthrate. We wish you joy, - Eden could yield no more. Land of the sunny clime, - the ocean's pride. With vales romantic, - and with cliffs sublime. And wraps our foliage in undying green. “Land of the vintage," - queen of southern seas. Scarce earn enough to buy the scantiest fare. Industrious care, well paid, by wide spread lands. To pauper placemen, - pensioned tools of state. And in its bliss forget their pauper pain. And heaven insult by making want a crime. And for its joys indulgent heaven adore. But dearer far the land we left, - home of the great and wise. But we venerate its classic halls, its blight intelligence. All that is rich in record crowns our own, our native shore. And hopes once blight now languish, or ye had not seen us here. And may sorrow never chill their mirth, or settle on their brow. Will wander still to some known spot, as if to hallow'd ground. Still linger in our memories, and round our bosoms cling.